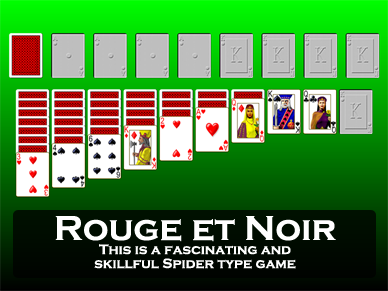 Screen shot of the game Rouge et Noir (similar to Royal Noir) from Pretty Good Solitaire. Royal Noir is a new game in Pretty Good Solitaire v16.2. It is a game I invented that is similar to Rouge et Noir. It is a two deck game. There are ten tableau piles. At the start of the game 8 cards are dealt to the first pile, 7 cards to the 2nd pile, and so on until 1 card is dealt to the 8th and 9th piles. The 10th pile is left empty. The top card of each pile is face up. The remainder of the cards form a stock that will be turned over one card at a time to a waste pile by clicking. There are no redeals. Where play gets complicated in Royal Noir is its special way of building on the foundations piles, which is just like the game Rouge et Noir. The leftmost 2 foundations begin with red Aces and are built up in color to Kings. The next 2 foundations begin with black Aces and are also built up in color. The rightmost 4 foundations, however, are not built up a card at a time at all. In these foundations, you must drop an entire 13-card sequence of cards. For the left 2 foundations, these sequences must be headed with a red King, the last two a black King. These sequences must be built in the tableau and transferred to the foundations as a 13 card sequence when they are completely built. In short, Royal Noir is just like Rouge et Noir except the stock pile is dealt one card at a time to a waste pile instead of being dealt a card at a time to each pile of the tableau. This makes Royal Noir an easier game since there are fewer cards blocking piles in the tableau.